Groundbreaking Discovery by the Babes Against Biotech! Note that there are 34 people who “like” this and another 137 who shared this post too! How many people are we spreading rumors to before actually doing some research first? This post is meant to just be inflammatory towards biotech as it contains all the typical propaganda of the A’oles. For lazy Hawaii people who don’t bother to research what is being said, it will ring true to them for now, only to be debunked later. 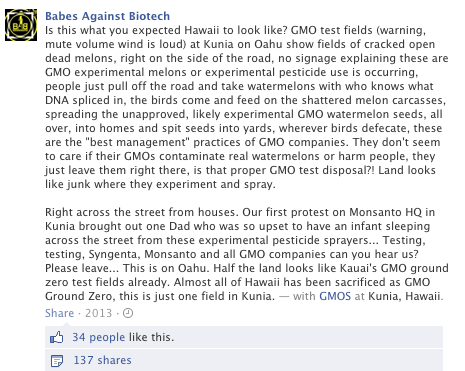 If they actually did a bit more detective work before posting this, they would realize that there is no such thing as a GMO melon or any such tests being conducted here in Hawaii. The more likely possibility is that this indeed is Monsanto’s fields that are subleased to another company who also subleases it to a melon farmer. And that melon farmer is probably Sugarland Farms, who grows his melons out in Kunia! Like someone once told us, that is why these women are not called the Intelligent Women Against Biotech. This entry was posted in Intelligence Quotient and tagged Babes Against Biotech, Facebook, Genetically modified organism, GMO, Hawaii, Kunia, Monsanto, Oahu, Sugarland farms on October 7, 2013 by hawaiifarmersdaughter.